A fun show for all the family, come and see the puppets explain the Christmas story. 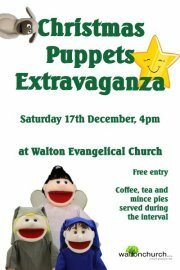 Puppets, nativity, carols, mince pies and refreshments ... what more could you ask for?! Entry is free all are welcome.